There are very few moments in our lifetime when we can remember exactly where we were and what we were thinking for most people who experienced Nov. 22, 1963, that was one of those days. As most Americans know, today is the 50th anniversary of our 35th President John F. Kennedy being assassinated. Below are the recollections from a few members of the Concordia family. As always, feel free to add to the conversation in the comments section at the bottom. Keith Frndak, president and CEO: I was sitting in Ms. Fisk's third grade classroom in Edinboro Elementary. The principal made an announcement through the school Public Address system (yes they were invented then) that the President had been shot. The class and school were in shock went home that night to sit around the 19-inch black and white TV and watched Walter Cronkite. The cause of the assassination was unknown so the school decided to ramp up the bomb drills where we all got under a desk and put a book on top of our head (still my favorite study technique). Judy Cline, payroll: I remember that I was at work when I heard the news. I had just graduated high school in June and it was my first job working at a trucking company in Monroeville. It was a small office and one of the truck drivers came in and told us that he heard it on the radio (no breaking TV news back then!) I don't think any of us got any work done the rest of the day we just stood around and cried and tried to justify what had just happened. When I heard the news, I couldn't help thinking back to when Kennedy was first elected. He was so popular in our neighborhood that I can remember running outside when the election results were finally in and so many of my neighbors were outside blowing horns and ringing bells as if it were New Year's. I remember him being young and handsome, and there was a charisma about him and his wife and family that was new and fascinating for all of us back in the early 60's. Cynthia Reichenbacher, director of admissions: I was in 10th grade Latin class at Butler High School when we heard the news over the loudspeaker saying President Kennedy was shot. It was a moment of disbelief that still lingers 50 years later. Some students were speechless; others, including me, cried. My next class was biology and I went to class, as did the other students. Then we received word that President Kennedy had died. Tears flowed; however, our teacher still made us take our biology test as scheduled. At that point, I did not care about the outcome of the test. Sadly, I can remember this moment as though it was yesterday. Shirley Corbett, finance: I was in my junior year at Massillon High School, English class. The Tigers (our football team) had lost the state championship in the AP polls to Niles McKinley High School that year, and we had heard that we would get a chance to play them on next year's schedule. When the school administrator came on the P.A. system saying that they were going to have the radio playing live with an important announcement, my first thought was that they were going to say something about the "big" game next year. How juvenile to think the news revolved around my little world! What a shock to hear that our President had been shot and killed. There was silence in the classroom, then crying and shocked disbelief that this could happen. The film of the motorcade and the actual shooting was aired over and over. Then the scenes of Jackie, her pink suit and pill box hat, the swearing in of Lyndon Baines Johnson with Lady Bird by his side so that we would not be without a President. At home, our TV was running continuously with coverage of the day. Who can forget John-John's salute? I think we were numb for days. That was MY president of MY country. 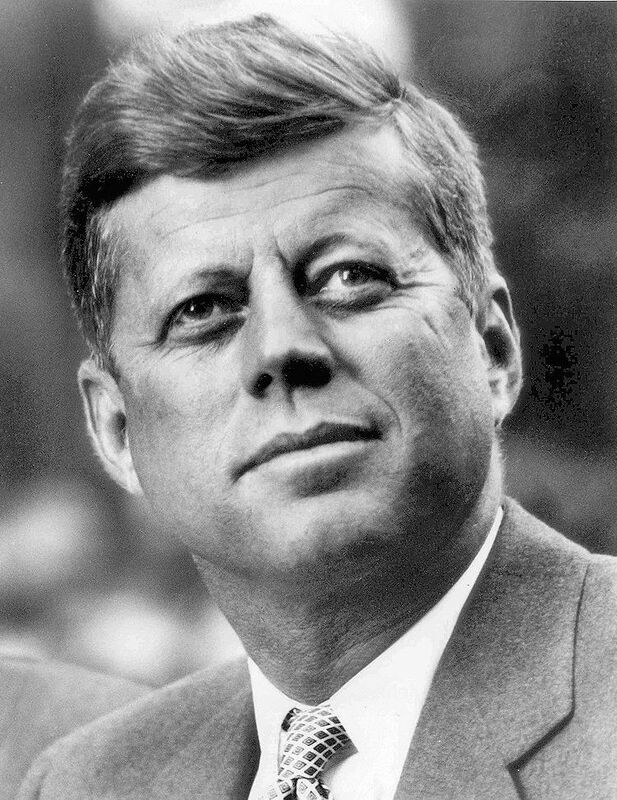 I still feel a sadness when I remember the assassination of John Fitzgerald Kennedy, President of the United States of America. Ida G., South Hills resident: I heard the news on the car radio while driving through snowy weather in Michigan. Jean G., South Hills resident: I went to visit a cousin in the hospital who had just given birth, and upon entering room, the cousin shared this tragic news. Catherine S., South Hills resident: I was watching TV when the show was interrupted with this news bulletin. Betty B., Haven resident: I was 35 and working at Mellon Bank at the time. I was on the phone with a customer, I think her name was Helen, and the radio was on behind me. I said to her, "I think I just heard the president has been shot, hold on." I wheeled back to the radio and listened for a minute. Then I got back on the phone and told her what I had heard. Unbelievably, we just moved right along and finished balancing her statement. That's so odd, looking back. Rev. Jack Hartman, director of chaplaincy: I was in school, and it was between periods, when we were allowed to do things like play ping pong. The principal came on over the loud speaker and announced that the president had just been shot and killed. In my next class, the teacher was acting like nothing happened, and a student told her the news. She thought he was just fooling around and made a pretty crude comment. She ended up getting fired because of the comment? That was the only instance in my lifetime where I felt like the world just stood still, even including 9/11. All we did for a few days was wait for the next piece of information. You just felt like the nation had lost its innocence somehow. To see the media come to a halt like that was amazing? Seeing John-John salute the casket just tore your heart out. Marysue Hitchens, housekeeping supervisor: I was 4 years old, at home with my family. I remember my mother telling of hearing on the radio about Kennedy's assassination and taking me and my sibling to the neighbors, who was a teacher, so the older sibling could watch the events unfold on TV. I felt sad because everyone around me was crying.